Monsoon are partnering with GoodReads to offer readers in the UK the chance to win one of 10 copies of our new book, Forbidden Hill (Singapore Saga, Vol.1.) by John D.Greenwood. The book can be described as a sweeping saga of historical fiction that spans the first 30 years of Singapore. On 6 February 1819, Stamford Raffles, William Farquhar, Temenggong Abdul Rahman and Sultan Hussein signed a treaty that granted the British East India Company the right to establish a trading settlement on the sparsely populated island of Singapore. 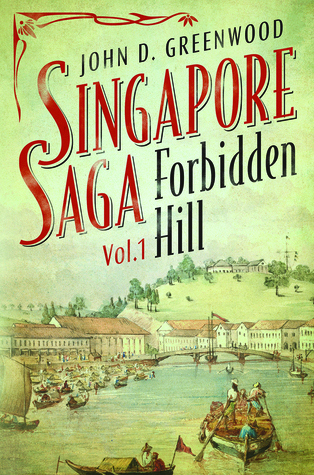 Forbidden Hill (Singapore Saga, Vol. 1) is a meticulously researched and vividly imagined historical narrative that brings to life the stories of the early European, Malay, Chinese and Indian pioneers––the administrators, merchants, policemen, boatmen, coolies, concubines, slaves and secret society soldiers––whose vision and intrigues drive the rapid expansion of the port city in the early decades of the nineteenth century. While Raffles and Farquhar clash over the administration of the settlement, the Scottish merchant adventurer Ronnie Simpson and Englishwoman Sarah Hemmings find love and redemption as they battle an American duellist and Illanun pirates. As the ghosts of the rajahs of the ancient city of Singapura fade into the shadows of Forbidden Hill, the new settlers forge their linked destinies in the ‘emporium of the Eastern seas’. The GoodReads Giveaway runs until 2nd December 2017. Giveaway ends December 02, 2017.